Thread: AZT300 / 750 Rollcall!! We're 3 weeks away from the ultimate AZ endurance test. Who's IN?? What are your goals (other than finishing) I know there's a bunch of locals lining up this year, many frequent this forum. Support the local AZ riders taking on this challenge of will. I'm in for the 300 this year. 4th time lining up for this beast, hoping on a 3rd consecutive finish. I'm shooting for a time goal of 3d 12hr. (So far my best time is 3d 22h 30m) A lot has to go right for that to happen. In for the three hundred! In for the 300. My goal is just to make it to Picketpost, but if I had to put a time on it - I'd be thrilled with a four day finish. Totally stoked, wish it was here already (or maybe not with the heat this weekend). Totally excited to see (I'm ashamed to admit) 270 miles of completely new to me trail. The 30 I have seen were at the end of the PP Pulverizer back in November. Ah man Joe I know you can do this, you got the mental and the endurance is there too - I really hope to see you at PCL! John, best of luck again this year. Look forward to seeing you in a few weeks. I haven't been able to get nearly as much pre-riding time in as I had wanted to prior to the race, and now due to a few curve-balls at work I'm not even sure that I will be in AZ during the race.. Provided that I can make the timing work I'm going for a 4+ day finish at PP. Joe, it's never gonna be perfect. You're more than ready to finish it. It's so much more of a mental battle. I look back to my first go in 2012 and think 'what the hell was I doing?!?' I barely had one bikepack under my belt (two weeks prior and we camped next to a truck!) But, I showed up and gave it a go. DNF'd it that year, but boy did it light a fire under my arse and i'm so glad I gave it a run. I learned so much that year. So, put the self-doubt aside and enjoy the ride. I think that's really cool that so much of the route will be new to you. It'll add just a bit more to the adventure and give you more satisfaction rolling into Picketpost. I hope we get a chance to share some trail time out there. Last weekend riding half of the Stagecoach 400 route was such a treat as 100% of it was new-to-me. Stevland - sounds like you're at least committed to Oracle!! Hope the timing works out Igor. You rolling the plus sized tires? Hope it does, but if not at least work provides me the opportunity to shred some sweet trails in SoCal while I'm out there.. Team Loco needs to get back out there and ride the Palm Canyon Epic route before it gets too hot, the Salton Sea addition to the Stagecoach 400 route covered some of that route, albeit in the wrong (uphill) direction. As for plus sized tires - of course, I do not own a bike with anything narrower than a 3" tread! Start your dot stalking, we have our first ITT'er on the route. Started the 300 just after 3a this morning. ^good move with the early heat this year. Best of luck to all...KPMA!!!! I'm in for a rookie run at the 300! Going to ITT with a friend on Wednesday so we can get all the good snacks and avoid the weekend traffic on Redington Road. This sounds like fun, I'm going to try this event. Is it hard? Is the trail well marked? holy fook - 3 weeks?? Where did the last year go? I'm in for the 750. Hoping for an assist from Rhino's great grandma on crossing the big ditch. While this isn't my first rodeo (300 in 2013), I'm plenty nervous about the Grand Canyon traverse. The thought of lugging 50+ pounds on my back for those 21 miles turns me to jelly. For us ordinary folks, there will come a time during the event when you want to be home , with your family, on your couch, beer in hand, watching TV. Parts of you that you didn't know you have will hurt and you just want it to stop for a little while. When that part of your mind starts talking, take out your spork and stab it (not literally, please) till it shuts the hell up. You are out there because you are hard. You are a badass who is going to make the AZT your *****. Now get pedaling! Joe, it's never gonna be perfect. You're more than ready to finish it. It's so much more of a mental battle.... So, put the self-doubt aside and enjoy the ride. ... You are out there because you are hard. You are a badass who is going to make the AZT your *****. Now get pedaling! Thanks guys... I know this a bit like asking your alcoholic friends if you should go out drinking Saturday night or stay home... So what the f... I might as well do it. Should be signed up by end of the weekend. Yes!!! I mean you have the team LOCO credentials and everything. I believe you are going to find out that you are more prepared than you think. Well.. Last sunday morning I along north west end of Sonoran North I was not feeling very prepared. Still I have time to dial back in for this. You'll never feel totally ready. But I've BP'ed with you - this is something you can do. Just get your mind right. Worse case you make a good run at it and don't finish. You still have a hell of an adventure, some great stories, and a few days out riding. All win. Plus, you can come back next year, own it, and still have done it in fewer tries than a certain angry guy we know - and that itself is worth gold. Trust me, you'll be kicking yourself if you sit this out. New to the MTB scene. Been doing the ultra running thing but my feet Don't like the distance so much. would Like to consider the 300 but what would be a gauge of if I can complete it or not? Was thinking about a 60-70 mile ride tomorrow from N. scottsdale up around the cactus classic course and back home and see how I feel. Gauge is time....time spent suffering. Simple as that. Time spent overcoming doubts, desire to quit and desire for a bed. The lone ITT'er just rolled through Picketpost, something like 4d 8h 45m through the heat!! Nice work. Wow!!! That's awesome especially for it being so warm/hot for this time of year. Way to go!!! I am signed up for real! Starting to get into it. Planning water stops etc. Still not sure on how many miles a day. Having covered just under half of the miles on the 300 in various stages prior I can say that every mile is not created equal. Speed can vary from 20 mph down to 2 mph. So the next 10 miles of the route... is it 30 min or 5 hrs? I think I know where most of the really slow spots are but you can always be surprised. My thinking is 75 miles a day = 4 days on course. So finish Monday evening. However anything can happen. Joe - Glad to see you decided to do this. Full confidence in you buddy!! Got my days off approved, just need to get the inreach signed up on TL! Anyone heading down Thursday morning I can hitch a ride with from Phx or Picketpost? Will pay for gas and breakfast/lunch! I'm planning to start riding once I get down to the start rather than wait til Friday morning. Dave Wicks began his ITT this morning...from Stateline CG heading south. He's attempting the first AZTR750 Yo-yo, UT-MX-UT. As if that wasn't hard enough, he was almost killed less than two months ago on a training ride in Australia. He had a car pull out in front of him while doing about 30mph. This is his first ride in over 6 weeks!! BAMF!! Looks like the forecast down by the Gila is going to be around 90º for the group start, a bit warm, but I'll take it. I'll take the heat over rain. Agreed! Heat over rain any day. The road has been plowed. I met up with Dave Sat. evening for a brew & to deliver his drop box he shipped over a couple months ago. He had a recent pic of AZ67, looked like something you'd see in Colorado. A giant channel where the plow went through, snow looked to be 5-6' deep on the sides. The road still had a thin layer of snow on it, but it looked rideable albeit slick I'm sure. He had snowshoes with his kit!! Not sure if he actually took them, but it was funny to see. I'm guessing the trail is in decent shape this morning, he seems to be making good progress and it through the meadows of potential death mud near Gov't Reservoir. For those who are lining up, if you haven't watched this video - you need to. Watched that quite a few times. Thanks for the reminder Jeff. It pumps me up every time. He did an amazing job of capturing the joy and the pain of the AZTR. Yep, and just imagining the extra self induced pain of the backtracking he had to do in order to capture those action shots. I rode Boulders/Ripsey on Sunday with a plan to fill up any empties there in the water cache at Freeman Rd. This wasn't needed as a trail angel, Sequoia, has been camping there and will stay until Apr 3 unless temps get too hot. He's been refilling as needed and will have the cache fully stocked when he leaves to go camp up near Pine. There are quite a few thru hikers out there now, and he said quite a few more are expected to start on April 1. I imagine most 300/750 riders will get to this cache before them and that could be a lot of pressure on it all at once, so consider dropping your own water off there or be as self sufficient as possible. Any water dropped off at any of the 'Bear boxes' along the AZT for the 'event' should be marked as 'public use' or not marked at all. No personal caching for use during the AZTR. Thanks for the update, that is good to hear as temps are looking rise back to normal to slightly above average for the AZTR start. Oh, and an update of Dave Wicks. His knee started acting up on him getting into Jacob Lake. Then ADOT informed him AZ67 is CLOSED to all users at the moment. So, he's bailing on his southbound AZTR and riding roads down to the Mexico border to meet up for the group start north. If you didn't already know, he's one bad hombre. For those of you planning to undertake the trek across the Grand Canyon as part of the AZTR750, Saris just launched a breakthrough piece of kit! Wildfire alert: AZT around Molino Basin is closed due to fire. Catalina Highway is closed from Mile Marker 0-7 while crews work. Stay tuned! hopefully will be open by Friday? The reroute option goes around Lemmon then backup the control road just so we can go down oracle ridge. Sounds like fun eh? Ha..
Well, I'm a Scratch for the 300. Bailed in Tucson. Canelo Hills were my undoing, fell behind with hydration and could never recover. I did manage to rally the troops over the latter part of day one. About an hour after leaving Sonoita my legs finally decided to join the ride. I met my first day goal of getting through Las Colinas, riding until 2 am. Slept great, but I must be allergic to the tall grass that is overly abundant south of I-10. While packing up my gear I started sneezing like crazy, this continued while on the bike. The route from where I camped into Tucson is really good, fast trail for the most part. I just had nothing in the tank. Rider after rider passed by me and it became apparent I was not going to make it up Mt. Lemmon safely. I finished! Yeah. On my first try too. Finished Rolled in PP late Monday/early tuesday 12:45 am. It was super hard. 4 days of 12-14hrs riding all the while trying to keep hydrated. For me food was never an issue by hydration was. Seems like I was a bit luckier than Schilling in that I never fell that far behind. I did get close however. So many high and deep deep lows. Crazy to look at your watch at 5:03pm having ridden all day and figure.. "Only another 5-6 more hrs to go today. Then I can stop and sleep." Very happy I made the choice to go out and do it. Finisher here... rolled in about 12 hours after JoeP. Same deal, food wasn't a problem - hydration was the big challenge. I never ran out but was close a couple of times - and that was with carrying more than I thought I needed. Blog write up and pictures to come. What a freaking adventure. The big takeaway for me was physically the effort was fairly constant - the big variable was the mental. Your body will keep going if you can stay in front of the nutrition and hydration needs. But your brain will tell you that you need to sit down and drink beer. Congrats Joe and Mike. One heck of an accomplishment!!! Good job Mike and nice write up. That elevation poster is making me mad I stopped at Oracle! Another ride report, not as awesome as Mike's since he finished!! Jeff Z is closing in on the ditch, bring it home Jeffro!! nice write up, thank you! Best description of Oracle Ridge I've seen. Man, that is an awful section. Oracle ridge man. What the heck. Somehow, even though you are going down in elevation, you are always climbing. They only way I can describe this is as a game trail. Very over grown, very steep. Just tough, tough terrain. If you want to simulate this, go to the gym with your loaded bike. Go to a stepmaster. Turn it on, then lift your bike from step to step while someone slaps your entire body and face with vegetation. Also make sure that someone just randomly grabs your bike to prevent you from lifting it. You see, branches are the perfect thing to get stuck in random bike parts that prevent you from moving your bike. Just wow. If you haven't done this section, you have no idea. Trust me. It's hard not to want to stop there after the beatdown to get there! We were able to get in/eat/resupply and get out and get to the first sandy wash after the Tiger Mine trailhead before calling it a day. Wish I would have researched this area a bit more - I was afraid of less than comfy sleeping arrangements - so when I ran across the first sandy wash I was sold! I didn't really realize there were several more after that. Should have pushed on. Jeff Z & Rhino are making the push up & out hopefully today. They both had secured camping permits for Bright Angel (which they used), Cottonwood & North Rim as a safety net if needed. My shoulders feel their pain today. Amazing stuff. Still can't comprehend that hike. My blog is up too. Nice job man. You'll never regret giving this thing a shot, but you will regret NOT doing in. Way to give it a solid run - now you know what to expect for next time! Great ride reports fellas. Strong riding Joe, you put down the type of ride I knew you could do!! Glad it all came together for a clean run. Mike, you'll be ready to finish it next year for sure!! Nice riding. Huge props to Mad Rhino & Jeff Z for getting the 750 done y'day. Looking forward to hearing the stories. Congrats to everyone who finished, lots of 750 riders the last couple days! let me put it this way. If you think it will be awful, you are underestimating it - greatly. Working on my post. It might take a few days. Rad! Well done man - both the ride and the write-up. You know, there are easier ways to get rid of those AES stickers!! Just a regular guy doing an extraordinary ride, outstanding!! Jeff, Nice write up and congrats! That last picture of you says it all. Jeff......You and John are seriously putting a hurt on my life plans at this point. time for you to make your triumphant return. Besides, you do have a score to settle with the AZT. Is it just me?? I don't think it is ok to sticker trail signs, Its basically vandalism/graffiti. These are multi-use trails and it is not our privilege to sticker them. Rant over! 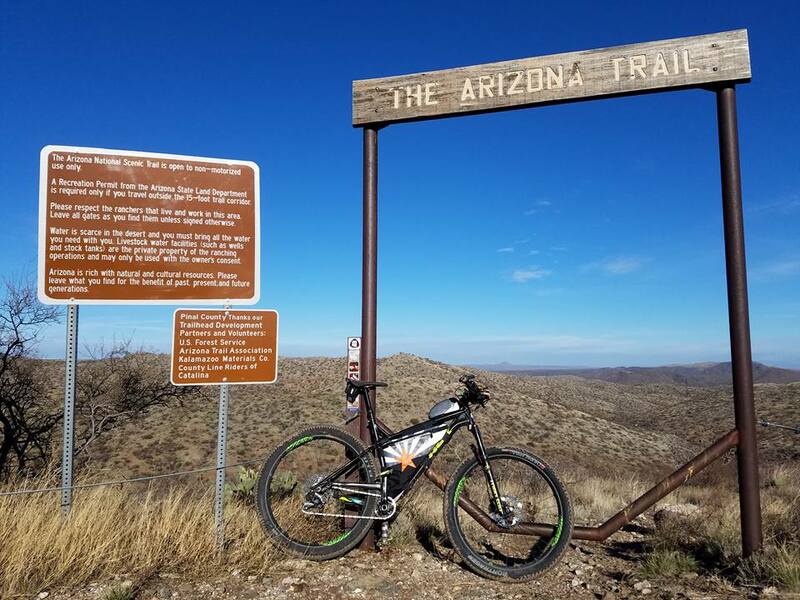 The AZT IS part of your life plans. Definitely some unfinished business. Thanks to all for the detailed TRs, I really enjoyed everyone's reports. It is crazy how varied the experiences are and how everyone suffers in different ways/places. That canyon hike is the only part of the 750 that worries me aside from running into adverse weather/mud. Hiking downhill is what will kill my knees and feet. Normally I can hike uphill forever, but after that downhill preceded by 10 long days of riding I can only imagine how brutal the hike up will be. I see some hiking training in my future. Jeff, with the difficulty getting the bike centered on the Manta, what is your opinion on using that pack for the 750? Do you think you could attach the bike differently so it would be centered better and remain more stable? I had planned to remove both wheels and strap to the frame. It seems like with rear wheel attached it creates a long load that would be more awkward and prone to sway. Guess I have plenty of time to try it out. I tested out my old hiking pack last fall and it held the bike nicely, but it is not the pack I'd prefer to run while biking. The thing is, I had it centered perfectly when I tested it pre-ride. Don't really know why I couldn't get it right in the canyon. Maybe some more attention on attaching it would have fixed the issue. I think having the rear wheel up so high also was a factor - easier to go out of balance. Rhino had both wheels off and mounted lower. I would think that would tend to be more stable. Other than that the pack was great. Yeah, it is a bit big for biking, but I never had an issue with finding space for stuff - despite carrying a pair of shoes and hiking poles the whole way. I can tell you that the first time I hiked to the bottom of the canyon, I had serious knee pain. The second time I used hiking poles and had very little. This time with the bike, no knee pain. I attribute that to 1. Hiking poles - you can use them to absorb a lot of the shock on the way down. 2. Lots of hiking before hand. I basically trained for the Canyon by doing weekly hikes a few months before the ride. Some of those were pretty big, but I tried to make sure I was always doing some climbing. The other benefit is that my muscle pain after the crossing was minimized as well. Question for the veterans, as to the hike through the canyon. Other than NOT having poles, why would you not just disassemble the bike, carry the wheels in your hands? Seems that would really minimize an obviously, out of balance load. Theres gotta be a reason? With that said, El Freako - Jeff H. didn't use poles and he carried his seatbag in his arms all the way across. Then again, he is El Freako. I imagine you'd regret dropping a wheel and watching it bounce into the nether regions of the canyon. Reminds me of scene from the original "Love Bug" .. Especially since that car used "bicycle tires" anyway. Cut to 2:20 for the full effect. I guess that makes sense, Just looks really hard on the back all bent crooked, like Quasimodo. Holy shheeeit. That's awesome....talk about bringing back memories!!! That's what I was envisioning with TT's post. Well done both of ya! !